Join the waiting list here if you missed out! On this page, you will find some generic information about the NUNC. For more details, please see the page for the upcoming competition by clicking here. If you have any questions, please check our FAQ page, and if that doesn't answer your question, drop us an email at natneurocomp@gmail.com. This page was last updated 28/10/2017. The NUNC is an annual competition open to all medical students in the UK and Ireland. It first started in 2013, and has since run annually at the University of Southampton, and now attracts over 100 students. 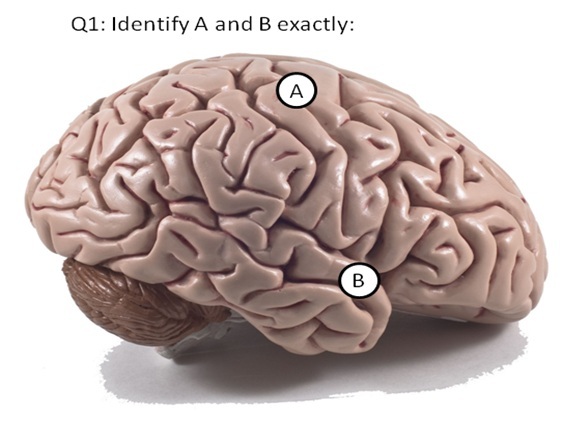 The neuroanatomy spotter consists of 42 stations, each with 2 questions. 1 minute per station. 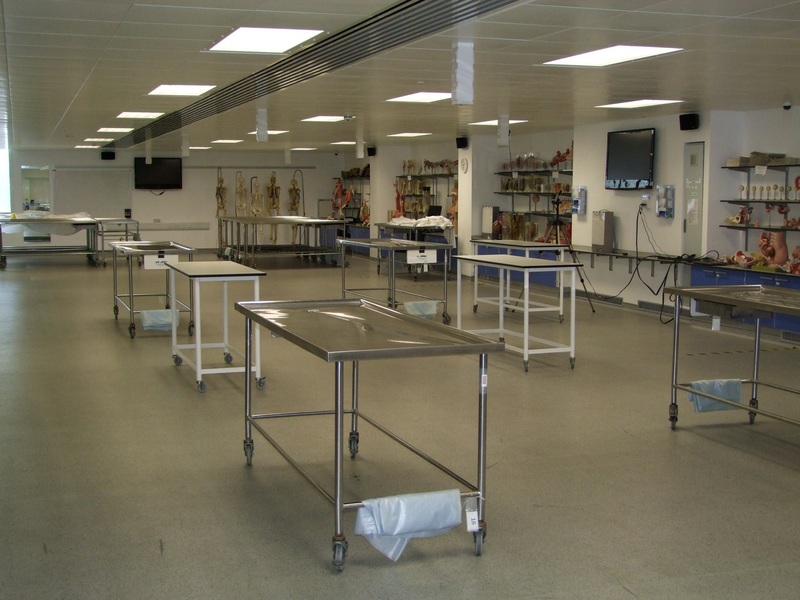 Students will be asked to identify neuroanatomical structures on cadaveric specimens. There will also be questions on neuroimaging. 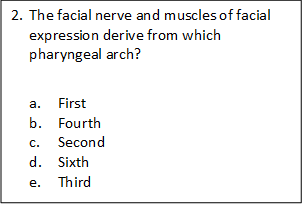 Below is a sample question. This is a 60 question Single Best Answer (SBA) examination for which you have 70 minutes. Each question has 5 possible answers. 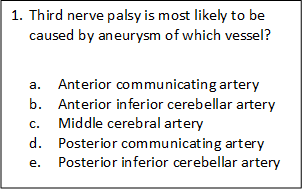 These questions will test your ability to apply your neuroanatomical knowledge to clinical scenarios. There are two categories: Clinical and Pre-clinical. If you have not yet started your full-time clinical placements at medical school, you will be considered a pre-clinical student. Everybody takes the same examinations, regardless of which category you fall into.You are only scored against other people in your category. The spotter exam consists of 42-stations, each of which has 2 questions. Each question is worth 2 marks. 1 mark is awarded for partially correct answers. The maximum score for the spotter paper is 168. The MCQ exam consists of 60-questions. Each question is worth 1 mark. The maximum score for the MCQ paper is 60. The exams are equally weighted. The scores are accumulated to give an overall score. For each of the two categories, clinical and pre-clinical, the winner and runner-up will receive a prize.Students who perform in the top 10% will receive a distinction certificate to recognise their performance. Following the competition, you will receive an email with your individual results, ranking and descriptive statistics for the cohort for those who aim to use the competition as an opportunity to build upon and develop their learning techniques, and also to those who aim to compete to gauge their performance against other competitors confidentially. In the afternoon, when you have completed the two examinations, there will be two talks from our guest speakers on a topic of neuroscience. We strive to make the NUNC a friendly and enjoyable event, and feedback from years gone past has been exceptionally positive. There are a number of reasons to come to the NUNC 2018. Alongside the exciting talks and indulgent refreshments, there are prizes for the winner and runner-up for both the clinical and pre-clinical category. Other students who also perform exceptionally well will be acknowledged in a distinction category. Coming to the NUNC will also give you the opportunity to demonstrate a commitment to the neurosciences, demonstrate your ability in neuroanatomy, meet and network with likeminded people, and see our exciting collection of neuroanatomical dissections. Refreshments will be provided throughout the day, including a large selection of lunch followed by cheese and wine. The NUNC is held at the University Hospital Southampton, Tremona Road, Southampton, SO16 6YD. Driving: Southampton is easily accessible by the M3 and the M27. There are a few options for parking. Firstly, you could park in the hospital carpark, although this is expensive. Up-to-date parking costs can be found here. Alternatively, there are a number of residential streets nearby that do not require a permit on a Saturday. These include laundry road and dale valley road. Parking spaces can be limited, so please allow plenty of time to find a space and walk to the hospital. By Train: Southampton has two main train stations: Southampton Airport Parkway and Southampton Central. Many trains will stop at both. If you can, we advise you get off at Southampton Airport Parkway. From Southampton Airport Parkway, we offer a free shuttle bus service to and from the hospital. You will be emailed about this in the weeks before the NUNC. The bus usually departs the train station at 09.30am, and we aim to get you back to the station for 17.30pm although we cannot guarantee. From Southampton Central, you will need to get a bus or taxi. There is a large taxi rank outside the train station. If you are going to get the bus, you will need to get the number 3 bus from outside the train station on the platform 1 side. This bus will take you directly to the hospital and takes approximately 25 minutes. By Air: Southampton Airport is a 5 minute walk to Southampton Airport Parkway train station. We recommend you walk here and get the free shuttle bus service to and from the hospital. You will be emailed about this in the weeks before the NUNC. The bus usually departs the train station at 09.30am, and we aim to get you back to the station for 17.30pm although we cannot guarantee. Where in the Hospital is the NUNC? The NUNC is held outside of Lecture Theatre 1, Level B, South Academic Block. From the main entrance, this is past M&S, right towards the lifts, a left immediately after the lifts following the signs to the South Academic Block. You will then need to follow this corridor before going down 1 level and following the signs for Lecture Theatre 1. The site maps for the Southampton General Hospital can be found here. The feedback of statistical analysis and ranking provides competitors a guide to interpreting their results, useful for those who aim to use the competition as an opportunity to build upon and develop their learning techniques, and also to those who aim to compete to gauge their performance against other competitors confidentially. You will usually receive this email within 6 weeks of the competition. Refunds can usually be offered until 31/12. However, beyond this date, purchases in preparation for the NUNC will have begun and therefore refunds will not be possible. This website and its content is copyright of the National Neuroanatomy Competition - © National Neuroanatomy Competition 2018. All rights reserved.